It was windy weather on 15th July 2015 in New Delhi, the Capital of India. Mrs. Sharma arrived home after a very hectic schedule at office. As she entered the hall, she realized that she has forgotten to pick up the grocery required for preparing breakfast the next day. She loathed the very idea of going back to the grocery shop. It simply required a lot of energy and time. It would mean taking her vehicle out from congested parking lot, driving through mad traffic, looking for a parking space, picking up the grocery, making payments and carrying the bagful of grocery and so on. Was it really worth the efforts or should she announce that tomorrow also her husband will have to compromise with breakfast? She looked out of the window and noticed that it started raining. What could she do? Normally, after a busy office schedule, she preferred to freshen up and relax, or perhaps listen to light music. Mr. Sharma, her husband, had arrived a little earlier than usual. He understood her plight. Mr. Sharma owned a bakery shop. He was working on the idea of partnering with an online delivery service to expand the reach of his business. He had downloaded information from internet about a number of on-demand delivery service providers such as Grofers, Bigbasket, Peppertap and ZopNow. He asked Mrs. Sharma not to worry and try out any one of them. Reluctantly, Mrs. Sharma called up Grofers and placed the order for groceries required by her instructing them to supply the same from her favorite grocery shop. About an hour later, as they finished their dinner and were having their dessert, the doorbell rang. The delivery boy from Grofers arrived, and delivered the order in full and collected the payment. Mrs. Sharma was relieved and indeed felt very happy!! The supply chain is all about efficient execution of an order. It was imperative that Grofers create a m-commerce platform that would be customers delight when it comes to placing the order. However, the execution must also excel the customer’s expectations. I. Define E-supply chain? How is supply chain managed online? What are the advantages and disadvantages of e-supply chain? List all the components and their processes of the e-supply chain. Support the explanation by theories and models. How technology can be used to improve the operation of supply chain? From the case facts, establish a new model for Grofers. This case study describes how a startup had leveraged IT to support its supply chain for creating a differentiating advantage to establish itself as a major player in the e-commerce space of Grocery supplies. The case highlights steps required to set up a flexible supply chain for optimizing its costs. The instructors should encourage students to scan data about supply chains of various e-commerce companies from the internet in preparation for the classroom discussion. The students should also be encouraged to explore the concept of flexible supply chains for facilitating the discussion. The students must be encouraged to prepare with the pre-reads for insightful classroom discussion and analysis of the case. This will help to explore the nuances of an e-commerce driven supply chain management. An additional exercise of ordering a product from Grofers can create an understanding among participants. The case can be insightful in teaching the MBA, executive MBA and Ph.D. students about the nuances of supply chain in the upcoming hyper local businesses. It will build an understanding of e-commerce supply chains and the future on e-commerce retail in Indian market. 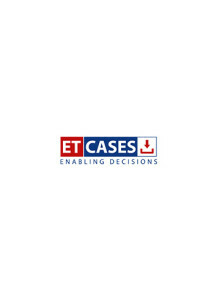 This case can be used to facilitate the classroom discussion on e-supply chain, logistics, and customer services in a mobile driven environment, forecasting, warehousing and order fulfillment. The on-demand pickup and delivery service market has rapidly evolved in all major urban centers in India. Major players such as Grofers, Bigbasket, ZopNow etc., provide such services across many verticals such as packaged goods, cosmetics, fresh foods and so on. Designing and maintaining a scalable, cost-efficient & flexible supply chain is a major challenge. This case study narrates how Grofers, a major player in the industry, could design, implement and maintain such supply chain that has given them solid competitive advantage by creating industry benchmark in delivery time. The case study begins by describing a real-life situation that encouraged a new customer to try Grofers. It discusses the background of the promoters and various phases of the start-up as it evolved from a B2B business in Gurgaon to becoming B2C service provider across many cities. The case focuses on challenges in establishing scalable, cost-efficient and flexible supply chain to support the evolving business strategy. The strategic inflection points of discontinuation of food delivery business and conceptualization of creating Dark Stores to maintain continuity of timely supply deserve special mention. The case describes the mechanics of how the supply chain is organized and managed.